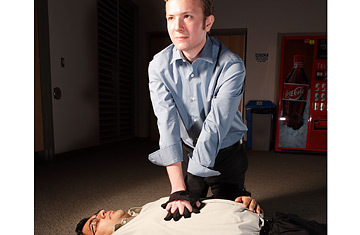 CPR always looks so dramatic on TV hospital shows, but in reality, chest compressions are hard to get right, even for trained health professionals. Enter the CPR Glove, the senior-year design project of three undergraduate engineering students from McMaster University. Once you slip it on, the black neoprene glove, embedded with sensors and chips, talks you through the proper way to resuscitate by measuring the amount of pressure you exert with each compression as well as the frequency of your chest pumps. If you aren't pumping hard or fast enough, the glove instructs you to "compress faster."